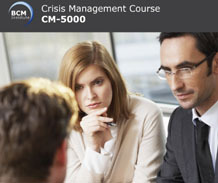 CM-5000 is a 4-day advanced level IT Disaster Recovery (DRP) course with an addition of 3 and 1/2 hour 150-Multiple Choice Question (MCQ) based examination, following the successful completion of the course. This workshop is primarily designed for advanced professionals who have a high degree of exposure to and understanding of CM, such as CM/BC managers, planners, and project managers. Crisis Management Certified Expert (CMCE) Certification is awarded to participants who successfully completed their CMCE examination, with verifications of the participant’s experience by BCM Institute. Strengthen organisational resiliency to counter major incidents and disaster. Appointed team leader of Crisis Management Planning team, team member of the Crisis Management, Emergency Management or Incident Management team. Appoint team leader of Command Centre Operations team or Emergency Operations Centre Team. CM or BC Managers, Organization BCM Coordinators and Practitioners tasked to drive large and complex corporate level CM programmes will reap maximum benefits from the concepts and practices. Experienced professionals with 3 years or more experience, from the security, risk management, facility, IT security, business operations who have direct or indirect responsibilities are encouraged to apply for their Crisis Management Certified Expert certification. This course incorporates a 150-Multiple Choice Question electronic exam the next day. The duration of the examination is 3 and 1/2 hour. 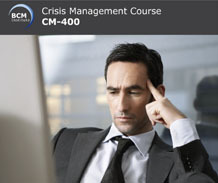 Candidates who achieve a passing score of 75% or higher are eligible to apply for the BCM Institute’s Crisis Management Certified Expert (CMCE) accreditation. The examination fee is included as part of the course fee. This course fee does not include application processing fee for the CMCE certification.